Reason for being a suspect:Was fired from Arizona State University for conducting dangerous cloning experiments. Became a biology teacher at the school. Had a lab in her classroom and was in competition with Mr. Boddy to find a cure for cancer. She was involved in a laboratory accident when she was thirteen and had plastic surgery to correct the facial scars. She was adopted as a child and never knew anything about her parents. Alibi:Was in her classroom next to Mr. Boddy's classroom experimenting with toxic chemicals. Reason for being a suspect: Was a student at the school and was assisting Professor Plum with her experiments. Alibi: Was in the restroom reading the graffiti on the walls. 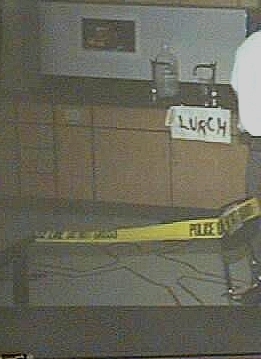 Reason for being a suspect:Is the janitor at the school and discovered the body. Always disliked messes left in Mr. Boddy's classroom. Alibi:Had just finished cleaning the principal's office and was bringing chalk to Mr. Boddy's classroom. Reason for being a suspect:Was a student in the school and greatly disliked Mr. Boddy because he failed the last two exams that were graded by Mr. Boddy. Alibi:Was in the locker room getting ready for football practice. Reason for being a suspect:Was a student in the school and greatly disliked Mr. Boddy because Mr Boddy told her that women weren't smart enough to be scientists. Alibi:Was at the pool practicing her synchronized swimming routine. Reason for being a suspect:Was the principal at the school and was about to fire Mr. Boddy due to numerous complaints from students and parents. Was told by her parents that she had an identical twin who was given away at birth. Alibi:Was in the library reading books on ancient methods of torture. Learn how to determine blood type of an individual. Gain an understanding of what an antibodies and antigens are. Learn how to perform DNA fingerprinting. Gain an understanding of DNA sequence diversity and uniqueness, gel electrophoresis, DNA restriction enzymes, and polymerase chain reaction. Each one of the suspects will be assigned to a group. Your task, as the defense attorney team for your suspect, is to attempt to prove your client innocent. The identification of blood type is based on the recognition of blood cells by a specific antibody. Four blood types are present in humans including A, B, AB and O. If antibodies to A blood are mixed with A type blood, the blood will coagulate or clump. If antibodies to A blood are mixed with B type blood, the blood will not coagulate or clump. The murderer has been identified to have A type blood. Antibodies to A type blood are available in order the test the blood type of the suspects. Place 10 ul of each blood sample two times on a glass slide or petri dish. Do not mix the different blood samples. Add 10 ul of test reagent A (type A antibodies) to one drop of blood and mix. Then add 10 ul of test reagent B (type B antibodies) to the other drop of blood and mix. Record your results. DNA from every individual is uniquely different from everyone else. Restriction enzymes (proteins) can be added to DNA samples which will "cut" the DNA whenever a specific sequence is present in the DNA. Since everyone's DNA sequence is different, the pattern of cut DNA will be different from everyone else. Prepare a 1% agarose gel. DNA which has been "cut" with an enzyme will have different fragments produced of different sizes. An agarose gel will allow separation of DNA fragments based on size. 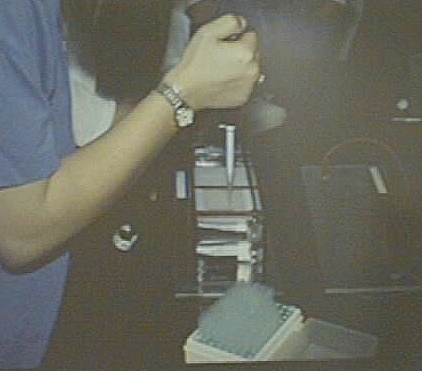 Tape both ends of the agarose gel cassette and place a well-forming comb in the slot at the end of the cassette. Take one bottle of premelted agarose and pour the agarose into the cassette. Fill almost completely, but do not overfill. Allow the agarose to solidify. 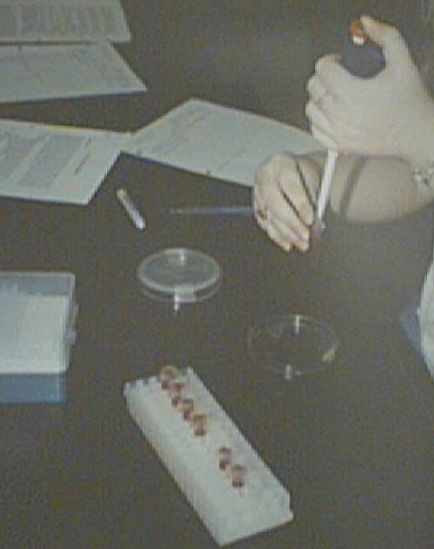 After the gel has solidified, remove the tape and comb carefully and place the entire gel cassette in the electrophoresis chamber (Place the wells of the gel over the RED bar at the end of the middle rack). Fill the chamber with 1X TBE until the agarose gel is submerged. 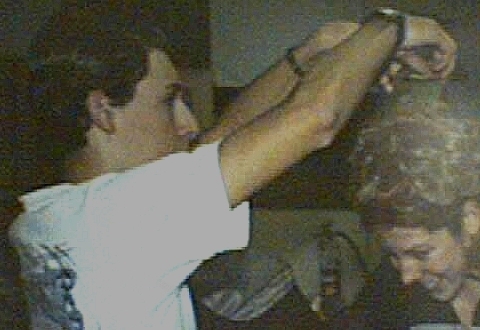 Samples of DNA from each suspect are available. These DNA samples have already been "cut" with an enzyme (restriction enzyme). Take 15 ul of each DNA sample (2 ug) and load into separate wells. Carefully place the lid on the electrophoresis chamber and plug in the electrical leads. Run the gel at 120V. The DNA and blue dye are both negatively charged and therefore will migrate to the positive electrical field. Large DNA fragments will migrate through the agarose gel slower than smaller pieces thereby separating the DNA of different sizes. When the blue dye is 50-75% of the distance through the gel, turn off the power supply and remove the gel. Wrap the gel in Saran Wrap and store in the refrigerator. Stain the gel. Remove the gel from the Saran Wrap. Place the gel in 0.25% methylene blue for 20 minutes. After staining, remove the methylene blue and wash the gel several times in water (let the gel sit for 5 minutes in water between changes). After about 1/2 hour, observe the DNA fragments in the gel on a light box. Draw a picture of the banding pattern for your records. Using all the data you have obtained (hair, blood, DNA), you should be able to make a case for your client. List below the evidence you have obtained. Draw the pattern of DNA bands observed on the DNA gel using the box below.